Note the close relationship between nobi and hane. Nobi can be defined as "a play at a point which, if played by the other player, would be considered a hane." 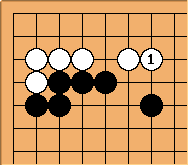 More precisely, assume a White stone has a Black stone at its immediate left, so that Black is threatening next to play on top (hane). If White instead extends solidly to that point on top of his original stone, that is called a nobi. If there are no Black stones attached to the White stone at all then the White move would normally be called a narabi instead. Also, to be called a nobi the newly-extended line must have an empty point ahead of it (if there is a stone there the move would instead be called a butsukari? or bump). Bill: No, it is not a good definition of nobi. Bill, could you clarify your objection to this definition? Chris is right in saying that the definition of hane is flawed, in that the presence of other friendly stones could make another term more appropriate, such as fukurami. And there are specific cases falling under this definition of nobi for which more specialized terms are available given factors like closeness to edge of the board, direction, etc., such as tachi. Are you pointing out these, or do you think there's something more fundamentally wrong with this definition of nobi? Bill: Aside from questions such as 'nobi' or 'tachi', 'nobi' or 'sagari', 'nobi' or 'hiki', the play in this diagram is a nobi. But would not be a 'hane'. Bob Myers: It's not a nobi, it's a narabi. Bill: It's also a nobi. Bob Myers: I don't think it is. I also would question the utility of having a term mean something so general as to be almost useless. Then again, what do I know. Let's track down a Japanese pro and ask him. Bill: Now, we might call 'tachi' because it stands, or 'hiki' because it pulls back. But we call it 'nobi'. It is not unusual for words to have overlapping meanings, or for some words to be specializations or generalizations of others. 'Nobi' is a general term, but hardly useless. Now if White played instead of Black, would we call that a 'hane'? I think not. What do you call ? Even clearer: is definitely a nobi, but would not be a hane. Bob Myers: We seem to have lost track of the underlying concept that there is a high-level mapping between nobi for one side and hane for the other. Details aside, does this insight seem correct, or at all useful to you? From an implementation point of view, of course, we need to identify the various cases where, depending on surrounding stones, a move that under a simplistic definition would be a hane or nobi instead gets a different name. Obviously, I haven't done that (well) above. And as you point out, there are cases where a move by one side might still be called a nobi while the same move by other side would not be called a hane. I presume cases could be constructed where the converse holds as well. Perhaps we could ask the question, what are the *necessary* (not necessarily *sufficient*) conditions for a move to be a hane or a nobi. Of course, it seems we disagree on basics here since I think that an attached stone of the other color is necessary for something to be a nobi, whereas you think a narabi could be called a nobi. On this point, consider the diagram at the left. Have you ever heard referred to as a nobi? 100 out of 100 pros would call this a narabi. Perhaps I've gotten myself too wrapped up here. Could you make a proposal for what you think the definition of a nobi or a hane is, with or without identifying some relationship between the two? Bill: As for nobi vs. narabi, I prefer the more specific term (narabi). That doesn't mean that it isn't a nobi. A cap is a hat, but I hardly ever call a cap a hat. As for a definition, I found one yesterday at http://www.ffortune.net/play/go/yogo.htm, which says that a nobi is a reinforcing play next to one's own stone. fits that definition. John F. I'm totally with Bob on this one (1). There is a semantic component to all the words. When you do a narabi you are thinking of lining your stones up side by side, for reasons such as avoiding contact plays. You are thinking of being compact. You are retrenching. When you nobi you are thinking of extending, stretching. You are being expansive. Really the complete opposite of narabi. Because you are stretching away from something, it means you are almost always moving away from an enemy stone (and ahead of it - there is also oshi, don't forget). It is signfiicant that there is also nobasu, quite common, but I don't think I've ever seen the causative of narabu used. (1) With the proviso that I'm still open minded about the hane mapping bit. I'm not doubting it. It's just that it's too novel a way of looking at it for me to take it on board all at once. But I am clear that I don't accept the counter-examples to the hane idea above. The very first diagram labelled tsuke and nobi is definitely not nobi. It's tachi. 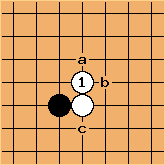 In the comment to the diagram showing the start of the tsukenobi joseki, no this cannot be a tachi or a hiki.Tachi has the idea of blocking along the side ("standing" in the way). Hiki carries the idea of retreating back towards one's own stones. Sagari is specifically to do with dropping down to the edge but is a species of tachi (cf. the old term, which is indeed the same character as tachi). All these terms have to be approached through the ordinary Japanese language whence they came. Bill: I like what John says about the semantics, but that brings in the intentionality of the speaker, which is subjective. In the nobi/narabi diagram, based on that, I would call a nobi. Bob Myers: We may be entering the province of philosophy here, but I would say it's an entirely honorable, useful, possibly even indispensable thing for terminology to reflect the intent of the person doing the thing we are applying the term to. Having said that, I don't think the intent is the defining factor for what's a nobi or hiki or narabi--I think it can be outlined logically, assuming we can agree on what's what. A play made next to one's own stone with the intention of increasing its power (influence). Now, you can't always trust general dictionaries to get the nuances right, but the implication is clear that nobi is a general term.